The psychrometric chart is a very useful tool that can unlock the mystery surrounding the properties of air. Over the next blogs, I will cover different aspects of the chart and show how it can be used in practice. The first step is to become familiar with the chart. 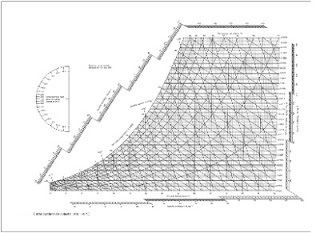 Below is a Psychrometric chart provided by CIBSE. It is a graphical representation that shows properties of air at 1 atmosphere pressure (101.325 kPa). This is the nominal air pressure at sea level. On the bottom axis (x axis) there is a temperature scale which starts at -10C and ends at +60C and shows the dry bulb temperature. On this graph, we can represent air conditions which have a dry bulb temperature between -10C and +60C. There is also a scale showing the specific enthalpy of the air below the temperature scale. On the vertical axis (y axis) at the right of the chart there is a scale showing the moisture content of the air – how many kilograms of water vapour is in each kilogram of dry air. This is a ratio and has the units kg/kg. Also on the vertical axis is the continuation of the specific enthalpy scale. On the curved edge of the chart there are scales for wet bulb temperatures and specific volume with the specific enthalpy scale drawn in steps. On the graph itself, the curved lines show relative humidity and the various straight lines show dry bulb and wet bulb temperatures, moisture content and specific volume. On the next post, I will look at how to represent air with a particular set of properties on the chart.